"Every movement of tai chi chuan is based on circles, just like the shape of a tai chi symbol; therefore, it is called tai chi chuan"
Although the martial arts are a minor path, we can by means of the lesser glimpse the greater. Too much talk about tai chi chuan is not good. It is much better to spend one's time practicing the form. It is through practicing the form that one actually comes to understand the sayings about tai chi. Between the first and second level, the requirement is to get rid of the stiffness in the body. Only when one has completely gotten rid of that tension does one pass through to the second skill level. Passing through to the third skill level is the time a person passes through the "tai chi gate". Without going through this process a person could never go through the gate because it is not easy. That is why you have ten thousand people and maybe one or two are really good. Tai chi chuan is the art of softness containing hardness, of a needle concealed in cotton. "It is like the full moon of the seventh month, whose light illuminates the whole world"
Everything in the universe is forever changing. Tai chi chuan may appear slow and unhurried to an observer, but the movements flow together continuously, without pause. Architecturally speaking, a curved line can support much more weight than a straight line. Likewise, in tai chi chuan, speed is not the main objective. Balance and stability are more important. Push Hands practice is extremely important because it requires an acute ability to sense and become aware of mistakes and flaws in the opponent's moves. If he is making no mistakes, then create an opportunity for them to occur. It is imperative that your own moves be executed flawlessly. As long as the opponent intends to knock me over or attack me, then his weakness will be exposed. "Preserve gains and maintain stability. Modesty brings gain, arrogance yields loss." This is an essential aspect of the political and personal philosophy of Chinese people. It is much more important to be spared defeat than to defeat the other. As long as I myself am not defeated, it does not really matter if my opponent loses. If he does not handle himself well, he will eventually be defeated. If he does handle himself well, that is also fine. Our founder has handed down a truly marvelous art; hard, soft, full and empty change with the situation. Diligently seek the truth in the teachings and deeply examine the internal, external, gross and fine. When the opponent approaches I draw him in; when he retreats I pursue him. If your emptiness does not conceal fullness, it is not effective emptiness. If your fullness does not contain emptiness, it is foolish risk taking. Within emptiness, adapt to changing situations; seek perfection in the principle of roundness. When the opponent uses "press", neutralize him with "roll-back". When he closes with you, use "split". "Pull-down" and "push" alternate with each other, and offense and defense all have their principles. The whole body is as one unbroken qì, as unified as a tai chi sphere. I can draw the opponent in from every point; my entire body is hands. However, if offense and defense are not clearly distinguished, full and empty will have no basis. It is like the full moon of the seventh month, whose light illuminates the whole world. When your training has reached the level of emptiness, then the distinction of offense and defense no longer exists. Master Hao Weizhen has researched the art for many decades and has a deep understanding of the true method of it. I was taught by master Hao and have been practicing the art day and night for many years. Now I have gained some understanding of the essential philosophy. Taking these findings further afield to compare my studies of xingyiquan and baguazhang, I find that the three belong to one family and this family divides into three different styles of forms. Although the three styles have different postures, they share the very same philosophy. 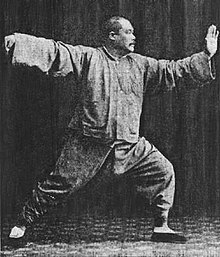 Wu Gongyi had great technique, body art, and internal jīng (power). He had many, many techniques. Ma developed yì (intent) and qì (breath) force, not moving outside, not having many techniques but having strong zhōng dìng (central equilibrium). From Ch'en Ch'ang-hsing (Chen Changxing) the transmission passed to Yang Lu-ch'an (Yang Luchan) of Yung-nien (Yongnian) county, Hebei, creator of the Yang style, and from Lu-ch'an's son Pan-hou (Yang Banhou), to Ch'üan-yu (Wu Quanyou) and his son Wu Chien-ch'üan (Wu Jianquan), creator of the Wu style. The aim of tai chi chuan is to improve health, prevent disease and to achieve longevity. Tai chi chuan has basic principles. Put very simply it has direction, location, light and heavy, empty and full, long and short, timing, etc. It also considers the body reaction, i.e. huà (neutralizing attacks), ná (joint locking and breaking), dǎ (hitting to uproot) and fā (discharging energy). All depend on the opponent's reaction in determining how one should move. There are three levels of skill in pushing hands: non-awareness, awareness after the fact, and awareness before the fact. Various people have offered different explanations for the name tai chi chuan. Some have said: 'In terms of self-cultivation, one must train from a state of movement towards a state of stillness. Tai chi comes about through the balance of yīn and yáng. In terms of the art of attack and defense then, in the context of the changes of full and empty, one is constantly internally latent, not outwardly expressive, as if the yīn and yáng of tai chi have not yet divided apart.' Others say: 'Every movement of tai chi chuan is based on circles, just like the shape of a taijitu. Therefore, it is called tai chi chuan.' Both explanations are quite reasonable, especially the second, which is more complete. Those who practice shaolinquan leap about with strength and force; people not proficient at this kind of training soon lose their breath and are exhausted. Tai chi chuan is unlike this. Strive for quiescence of body, mind and intention. Scientific principles could apply to every aspect of tai chi chuan skills. Even more, the ways that empty and full transform are unfathomable. When practicing the form, the entire body feels comfortable; when pushing hands, the entire body feels lively. Therefore, after a long period of constant practice one not only avoids being tired, but actually feels more spirited after doing tai chi chuan. This indicates great intensity of delight. However, beginners, who have not yet grasped the fundamentals, must go through a period of forbearance. Then, eventually, they will spontaneously enter the most enjoyable stages. When you do the forms, you relax. The mind has to be relaxed in order to be joyful and make progress to the other levels. To complete the moves of the form with a continuous flow is the hardest to achieve, even at the senior level. The form's continuous coordinated motion is beautiful. Coordination deteriorates with age, but with the practice of tai chi chuan, this won't happen. 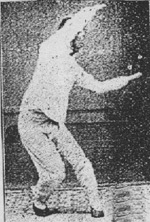 on the differentiation of tai chi chuan taught at the Beijing Sports Association into different styles, Yang and Wu after 1914: It was the students who began to define what they were learning from the instructors who taught it to them while they studied with the masters from both families. We didn't say the styles were different; the students said they were different because of the form instruction. It is very sad that the elders in the tai chi family have passed. They devoted their lives to the development of tai chi chuan in China and everywhere. To the whole world. The postures or form differ considerably between different schools of tai chi chuan, although their fundamentals and principles are basically the same. This may even occur between learners of the same style and is related to what one has learned from one's teacher, the level of understanding and how early and late one learned the exercise. Spontaneous evolution and development is often the rule as time passes on regardless of the art. The matter has also been compared with one's handwriting, which may be considerably different from another's. on the application of the form Turn Body Double Kick: If the enemy attacks with a punch, you meet it with your upper hand, and kick him with your right foot. If the enemy takes advantage of your movement to launch a second attack, you can dodge it by turning your body, divert the oncoming fist with your right hand using the "plucking force" and kick at his abdomen or the side of his body with your right foot. The manoeuvre is called "diverting the oncoming force into emptiness". The meaning of the tai chi symbol lies in the mutual production of yin and yang, the complementary exchange of hard and soft, the thousand changes and the ten thousand transformations. This is the basis for tai chi chuan. Push hands is the embodiment of the tai chi symbol. 1. Straighten the Head. Hold the head and neck naturally erect with the mind concentrated on top. 2. Keep the chest slightly inward to help sink the breath to the dāntián. Sinking the chest also helps to round the back. 3. Relax the waist. All movements depend on the waist. A relaxed waist makes the two feet able to form a strong base. 4. Distinguish between solid and empty in stances. This gives stability and flexibility in movement. 5. Sink the elbows and shoulders. 6. Use the mind instead of force. 7. Coordinate all movements of the upper and lower parts of the body. 8. Create a harmony between the internal and external parts. 9. Maintain continuity. All movements are continuous in an endless circle. 10. Tranquillity in movement. Movement occurs while there is stillness inward. Would be given to the world by the Yangs of Hebei? "Some people go too far and they can get into trouble. They may suddenly see angels in the sky, or immortals coming to visit them. There can be a lot of imaginary brain activities. But you have qigong which is naturally embodied in tai chi chuan. It is a more natural aspect of qigong and not a special kind of study that brings you into another sphere." In tai chi chuan you want to be calm and collected, so you have focused attention to observe what the opponent is doing to you. Within that quietness, you are ready to spring, you are ready to move. So the quiescence and movement go hand in hand, working together. In qigong practice, you become very, very quiet. You are so quiet, you actually tuck yourself away from the normal world into another state. Some people go too far and they can get into trouble. They may suddenly see angels in the sky, or immortals coming to visit them. There can be a lot of imaginary brain activities. But you have qigong which is naturally embodied in tai chi chuan. It is a more natural aspect of qigong and not a special kind of study that brings you into another sphere. The basic requirements and essentials we have talked about are very important points. But it is like many things. You can know it but sometimes you cannot carry it out. You may not be able to do it. You may need a long time to train yourself, slowly, slowly accumulating experience. The basic method behind all of this is very, very simple. It is just to loosen the whole body. Within the loosening of the body, you have to address two issues. One is that you have to loosen your mind, the other is to loosen the body. But the looseness is not just soft or a limp kind of looseness. Instead it is a lengthening, extending, opening up looseness. So you must understand all these things when you practice. Many people say: "Oh, I know all about that." But knowing doesn't mean you know how to do it. Many people do not know how to practice. on three levels of development: 1) Practice in order to learn what tai chi is and make sure all the movements and and ideas are clear. 2) Reach the point where one understands tai chi in one's practice. 3) Use it freely and experience it at a mysterious and wonderful level. We have to pay attention to the relaxation of our chest. ...If our chest is stiff, it will be filled up with our qì. Once our chest is full of qì it cannot coordinate the movements of the whole body, and then we will certainly be beaten in any contest. Whenever one moves, the entire body is light and nimble, and each part of the body is connected together like a string of pearls. Qì resonates like a drum, the spirit internalizes. If there is above, there must be below, if there is a front, there must be a back, if there is a left, there must be a right. As intent rises it also descends. Attributed to Wang Zongyue in the Salt Shop Manual text. If we see a solid opportunity and fail to take advantage of it, how can it be said that our art is complete? If we do not practice according to the applications of the principles, we can work forever without developing a superior art. Spiritual cultivation brings great virtue"
One standard fixed for all eternity"
As a martial art, tai chi chuan is externally a soft exercise, but internally hard, even as it seeks softness. If we are externally soft, after a long time we will naturally develop internal hardness. It’s not that we consciously cultivate hardness, for in reality our mind is on softness. What is difficult is to remain internally reserved, to possess hardness without expressing it, always externally meeting the opponent with softness. Meeting hardness with softness causes the opponent’s hardness to be transformed and disappear into nothingness. How can we acquire this skill? When we have mastered sticking, adhering, connecting and following, we will naturally progress from conscious movement to interpreting energy and finally spiritual illumination and the realm of absolute transcendence. If our skill has not reached absolute transcendence, how could we manifest the miracle of “four ounces moving a thousand pounds”? It is simply a matter of “understanding sticky movement” to the point of perfecting the subtlety of seeing and hearing. Were passed to Confucius and Mencius. Were exemplified in the seventy-two disciples, Emperors Wen and Wu. That we may restore our primal purity. Regulate it well and the qi and body will be whole. Truly the mind is the genuine article. One standard fixed for all eternity. This page was last edited on 15 April 2018, at 20:06.